So I'm now a pregnant blogger which is hash tagged as #pblogger. So I thought it would be great to start documenting my pregnancy journey with you and then carry on my blogging as a mum. The reason for this is that there is a lot of 'rubbish' written on the internet, people making the whole thing either sound so awful that it puts potential mums off or so romantic that when some ladies do fall pregnant they are horrified at the truth. I have never been naturally maternal or had a yearning to really want kids the way some women do. I am not sure what caused this but I was always so ambitious and wanted to travel the word that having a baby seemed like an end to my endless debauchery and adventures in life that it wasn't on my hit list to do straight away. For the last eight years of my life I had been caring for my mother who unfortunately got Alzheimer's Disease as a result of dementia really early at only 58 years of age. My mum was a strong, intelligent and striking woman who was very respected in her career as an Anaesthetic Sister in the hospital theatres, had travelled the world, survived cancer and becoming a widow and always had a great outlook on life. The shock of her getting this disease really changed my life and was so hard happening to someone I idolised. I think that in my life it halted me in moving on with any family of my own because I was so consumed with making sure she was okay in her last years in a care home and didn't really look at my own life and what I wanted out of it. I had a bond with my mother as all daughters and sons do. Even in my mum's later stages of the cruel disease when my mum didn't recognise anyone or couldn't feed herself, I would still catch her eyes and she would look at me and remember me and give me a look only family know about. That two second stare would be enough for me to carry on a whole week at work or sleep at night. Towards the end when I knew my mum was passing I couldn't help but think how much I wanted to have that same special bond with my own child. By now I was lucky to be in a great relationship with my partner of nearly three years and we started trying for a baby. We worked out I was pregnant a week before my mother passed away. Funny how the circle of life works. I believe that she knew and it was something she was waiting for. That's why I wanted to share my journey with you, because I've had to find out everything from the internet or friends and I don't have any mum to ask advice for. I'm sure I am not alone as a mum to be in this situation and I am sure that there are also women out there that don't have much support, or even a partner to talk to, so this is for you. I used the phone app called MonthPal for those people wanting to know what they can do to help conceive. Obviously, it had to be digital for me. This is an easy app that lets you put in your period date an then shows you yellow days for when you should be ovulating to make sure you try on these particular days. It was very unfortunate that the exact yellow days where when I always argued with my partner and the last thing we wanted to do was be intimate as it was always before my period was due and I'm the sort of girl who likes to eat chocolate and cry by myself to some stupid movie but we made an effort. I also ate really healthily and got my weight down and we got loads of fresh air out walking all the time which I am sure helped. It didn't take long at all to conceive, maybe about three months. That's lucky I am told and I am sorry for the people who are trying really hard to get pregnant as it must be heartbreaking to keep trying and I hope you do get there in the end. One more thing that I did before I conceived was have a whole week away from my partner at a theatre school. Every day I relaxed and did singing exercises and talked and laughed so much. My mind was constantly taken away from everyday stresses and the worry about my mum being sick in hospital was shadowed by actually having a week that was just about myself. I felt guilty when I came back because I am very close to my pet cats and seeing my mum (I know this sounds very sad to some people lol) but I felt very rejuvenated and that was when I conceived. Also the break away from my partner made me really appreciate him when I was back and we were very close. So I would recommend if you are trying to conceive to have at some point a complete break from your partner to relax and to come back on the 'yellow' days to miss each other and enjoy your time together again. You hear all these stories that a woman just 'knows' when she is pregnant, but I didn't feel anything, I just 'hoped' that I might be. It is disappointing when a woman tries and you have a pregnancy test and it is negative and you come on your period comes soon after as the side effects of a period are very common to pregnancy symptoms. So you see there is not much in the actual difference of PMS and being pregnant so women can be forgiving for thinking they are pregnant each month or just dismissing pregnancy as period pains. One big bit of advice which I would say is, don't use cheap tests! I thought I might be pregnant because I had missed a period and did a really cheap pregnancy test from a budget shop. It turned out to be negative even though at the time I was pregnant. Did you know that it is possible to have a negative result if you are pregnant but not possible to have a positive on a test if you are not pregnant. So always take a second test if you are doubting the test as it may just be that you were too early. I felt very weird when I found out and every woman I imagine feels a different emotion at this moment. At first I started panicking like what am I doing, how can I afford this, all sorts of weird and silly things but at the same time I was so excited I started telling my cats and then I just wanted to tell everyone and anyone I knew but I didn't. I only told my partner that night and then my brother and kept it quiet until the 12 week point mark. Unlike my partner who I since found out had told everyone soon after I told him because he was so excited. I kept forgetting and would then remember again and smile. The strongest feeling I had though was the fatigue wash over me like a big fog. I get heavy periods and bad PMS anyway so I'm sure this is why I felt so tired. It was a struggle to get out of bed and I looked very pale. Luckily I never had any morning sickness. I called my partner to come over that evening and made him dinner. It was his birthday which was lovely. I told him I had another present for him and told him to close his eyes and hold out his hands. I placed the positive test in his hands and he asked if it was a pen and then started taking the lid off the swab end so by then I was shouting just open your eyes before he started touching it. He was very stunned and then started getting very excited. It was a nice moment just between the two of us and I think we must have lay in bed until 4 in the morning discussing names, what position the child would play in the Arsenal football team if it was a boy and what West End musical they would appear in if it was a girl! Straight away I stopped smoking and drinking and started putting good food in my body. You will find this very easy as your tastebuds don't really ant anything like this and as soon as you know you have something in your belly growing you won't want to anyway. The next step to pregnancy is your first maternity appointment at the doctor which I will tell you about in my next post. In my upcoming blogs you will also find out about friend's reactions, symptoms, problems, hospital visits and the glory of being pregnant! 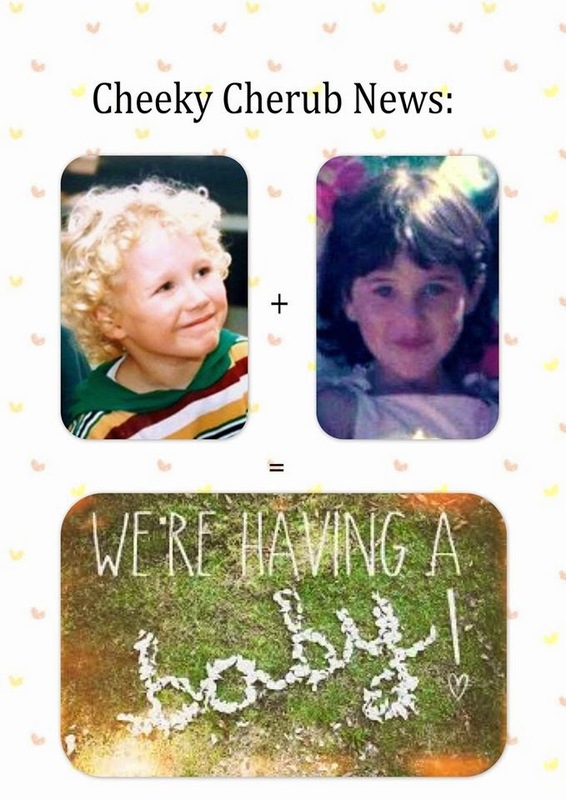 PS- the picture above is the announcement picture my partner and I used to tell our friends- we were both five years old and very cute.